Affordably outfit latching interior doors with this Hartford Passage Knob 6 Pack set from Defiant. The new design feature of a 70 mm Rose Plate conveniently covers paint rings left from old door hardware removal. This unit easily mounts to doors 1-3/8" to 1-3/4" thick with the included hardware, perfect for residential doorways where locking is not needed. It also features the EZ Fit backset latch with an interchangeable faceplate for drive-in and traditional installations. The sturdy door knob nicely coordinates with other plumbing and lighting fixtures in your home for a cohesive look. A lifetime warranty ensures the durability of these units for long-term use. Prestige Carnaby Satin Nickel Bed/Bath Door Knob Baldwin Hardware has a rich heritage of delivering modern luxury to discriminating homeowners. Baldwin Prestige Series offers effortless, accessible style and luxury. With the Baldwin Prestige Series, any homeowner can instantly create an atmosphere of confidence from the moment someone knocks on the door. Baldwin Prestige Series is affordable luxury. The Baldwin Prestige Carnaby Knob features a traditional-oval design which is offered in keyed-entry, passage, privacy, and half dummy functions. 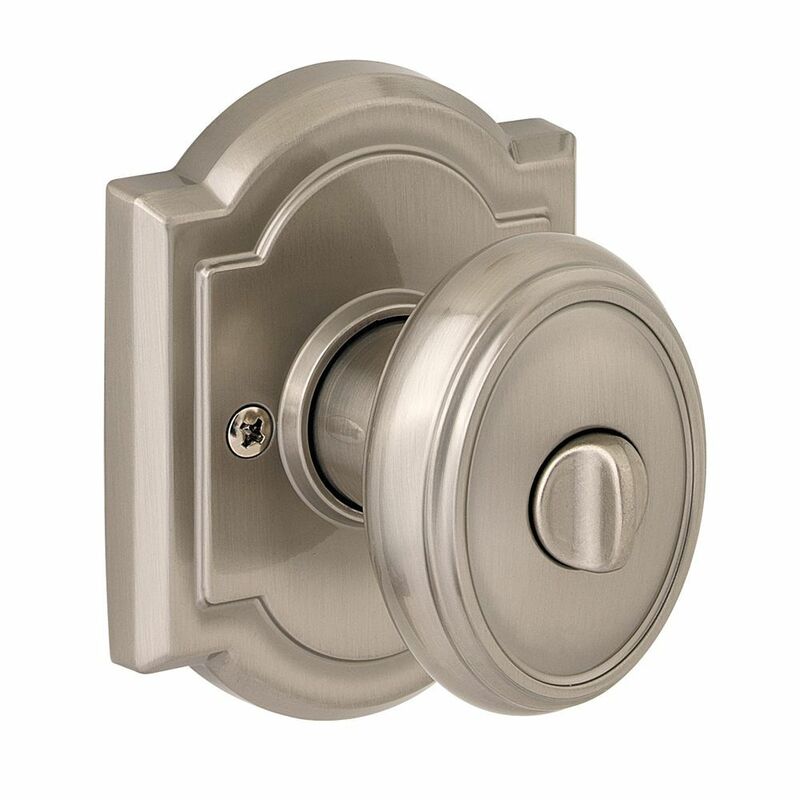 Prestige Carnaby Satin Nickel Bed/Bath Door Knob is rated 4.5 out of 5 by 10. Rated 5 out of 5 by Frank from Great quality, looking to to replace all the knobs with... Great quality, looking to to replace all the knobs with similar ones. happy with the choice selected for replacement. Rated 5 out of 5 by JoJu from Solid product I just installed this doorknob and I am happy with it. It looks good, feels solid. The instructions weren't super clear but simple enough to figure out. The installation was easy to do. Rated 5 out of 5 by Anonymous from These door knobs are now throughout my home. Excellent... These door knobs are now throughout my home. Excellent quality and very nice looking. Rated 5 out of 5 by Lab77 from Gorgeous and easy install This knob is built to last. It's heavy and beautiful. I replaced every lock in my house with these and the install was a breeze. Coming from a woman with no carpentry skills.